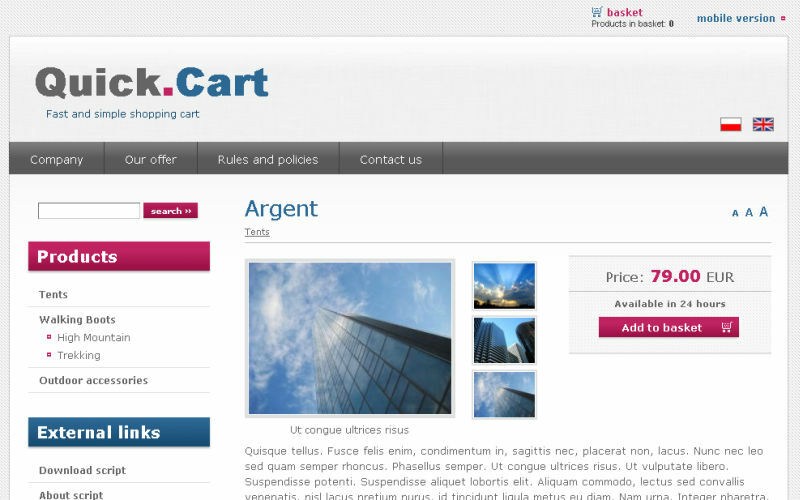 Quick.Cart is one of the simpler shopping cart scripts worth mentioning that we came across. It works perfectly when you are after simple maintenance and high efficiency script. Simplicity of customization and use makes it an interesting choice for people looking for a script to fit their specific needs. Quick.Cart stores data in flat files so installation is nothing more than setting permissions for several folders on a server. It takes only a couple of minutes. The script structure also makes it very easy to create site's graphics, which is mainly just working on some CSS's. Managing menu, products, images or configuration does not require any special skills. Clients who will run their site themselves, should have no problem with it, even without any prior experience with online shopping carts. It's all due to clarity of the administration panel and a popular WYSWIG editor TinyMCE. The script may not be as popular as other ones, but its community is still strong. Clean HTML code, friendly links and defineable titles, meta descriptions and link names for each subpage gives Quick.Cart good browser positioning. The script code is not very extensive so it can take quite a heavy traffic, because it's extremely fast. It's couple and even dozen times faster than OpenCart, Prestashop and especially Magento. It doesn't need to connect to a database like SQL. It doesn't make much demands on a server. An unpacked script takes only 1.2 MB, where the WYSWIG editor by itself takes 0.4 MB. Not many scripts can be said to comply to so many standards like like HTML 5, CSS, MVC and WAI (handicapped accessible pages). The last of these standards can be a significant 'pro', especially for public office websites. Implementations like these have actually been made. The script does not have abundance (thousands) of plugins and skins available for other scripts. Functionalities that could compete with those of OpenCart or PretaShop are available only in paid editions. The database that is an advantage for a simple website can also be a drawback when the site has thousands of products. The fault is in the fact that efficiency of flat files decreases as the amount of data increases. Modifying functionalities often requires PHP knowledge. Small number of plugins often makes it necessary to modify the script yourself. So when e.g. you need an additional field in a form, it may turn out not to be so easy. Quick.Cart does not include any built-in design modification tool. Each time you try to change your page layout you need to edit graphics templates, which luckily are quite clear. The script is based on a "Smarty"-like template system. Quick.Cart is a very good script for your Internet shopping site with not that many products if you don't need all the fireworks. It's one of the easies to use scripts available on the market. It requires some knowledge of HTML and CMS to work on the site graphics, since there are not so many templates available. PHP basics also come in handy when there's need for functionalities modification. The good news is that there's not much of the PHP and HTML code what makes modifications much easier. It's extremely efficient as long as it doesn't manage thousands of products. For more demanding programmers there's the paid edition or other scripts like OpenCart or PrestaShop. 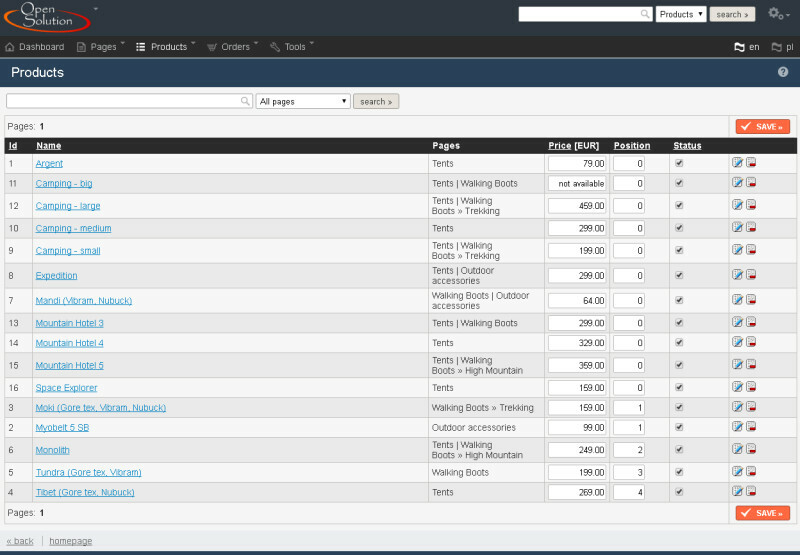 I'm very pleased with Quick.Cart, it's easy to modify and the backend is very userfriendly. Flexibility and tweakability are unlimited. Highly recommended. Interesting script. It is incredibly fast, just read this: http://opensolution.org/why-quick-cart.html. Quick.Cart is perfect tool which is distinguished by it's simplicity, functionality and administrator's panel conveniency. Shame it is not suitable for bigger online stores. Very nice script with best performance. I used Prestashop before and when my webshop received 3000+ visits per day, my server colapse. I've change script to Quick.Cart.Ext and now i have no problems with server. Admin panel is less complicated then Prestashop. Great! I think that Quick.Cart is the best "raw material" for webmaster. It gives you possibility to make functions and facilities you ever dreamed of. Easy to setup, fast. Great script. Try it! 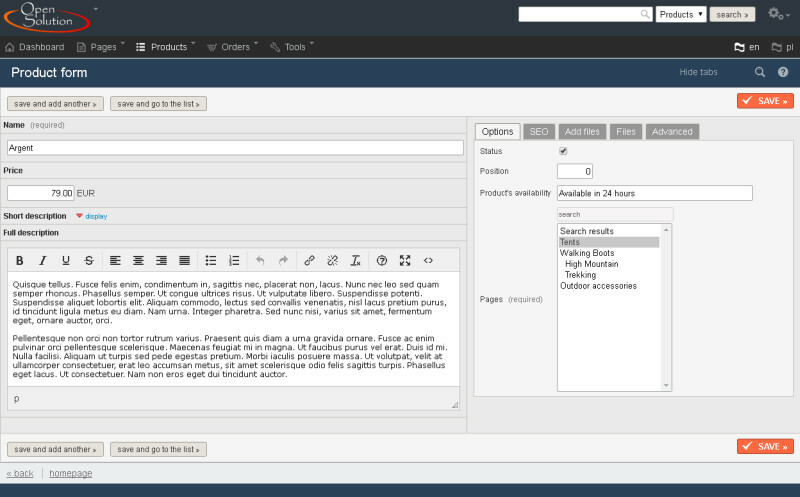 I am happy with Quick.Cart platform, the code really works and the admin panel is also more userfriendly than others.